Jen Hersh has been a member of the SGCS community since 2009 as a first grade teacher. She is excited to serve the Seven Generations community as the first EIC Curriculum Director. In this leadership position, Jen mentors, coaches, and plans collaboratively with teachers to strengthen our adopted EIC curriculum model, community partnerships and instructional practices. 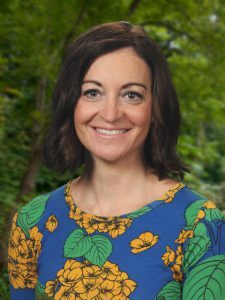 Jen also helps guide and facilitate professional development and monitors progress of student achievement to ensure that curriculum and instruction are meeting the diverse needs of our students. Jen’s family has lovingly dubbed her a kid magnet. She’s always enjoyed the curiosity, wonder and laughter of young children, so becoming an elementary teacher was a natural choice. Jen earned a B.S. in elementary education and early childhood education from the University of Delaware as well as a M.Ed. in reading and Reading Specialist Certification from East Stroudsburg University. Teaching since 1993, her professional experiences range from a classroom teacher of Kindergarten and first grade to an Instructor of literacy and science methods courses and student teacher supervisor in the M.Ed programs at Cedar Crest College and DeSales University. Jen was also a staff naturalist at Pool Wildlife Sanctuary for three years before joining Seven Generations. Her latest accomplishment was receiving the 2012 Da Vinci Science Center Hall of Fame Grand Master Award for Outstanding Science Teaching. Born and raised in the Lehigh Valley, Jen loves spending time with her husband and two children. Her family loves to travel together and have a goal of visiting all the National Parks. Contact Jen Hersh at jennifer.hersh@sevengen.org. What is it like to work at Seven Generations? Children need to believe they are agents of positive change and be given the opportunity to act on this. SGCS is a place that allows just that! Kids learn experientially and within the context of their community. I am excited to be the spark that ignites my students’ passion to learn and help them achieve their growing dreams.